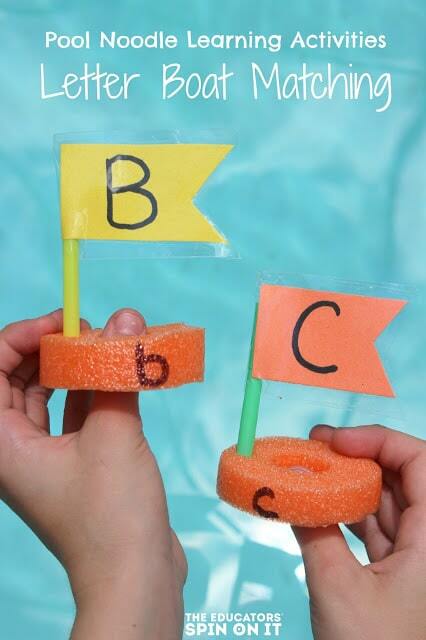 For less than a few dollars, you can make and build this pool noodle alphabet boat matching game with your child to help them learn their ABC’s. Match the alphabet mast to the corresponding boat, then float in a pool or bathtub. A fun pool noodle game for summer learning! 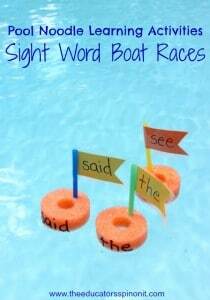 This would make a great sensory literacy center this summer in a classroom too! Affiliate links to products included in this post. Learning Objective: Identify the lowercase and uppercase letters in the alphabet. 1. Cut the mast out. 2. Write the letter on the mast. 3. Place a long piece of tape down sticky side up, a little more than twice the length of the mast. 4. Set the mast down. Place the straw next to it. 5. Bring the tape over to cover both sides of the mast. 6. Press to seal the edges. 1. Use the open end of the straw. Twist and push to make a hole in the top of the cut pool noodle. 2. Write the matching alphabet letter on the boat. Use the same case as the mast for young children. Use opposite (uppercase and lowercase) letters for children who are ready for this skill. 1. Take all the masts off the boats. Gently mix. 2. Allow the child to find the matching mast for each boat. 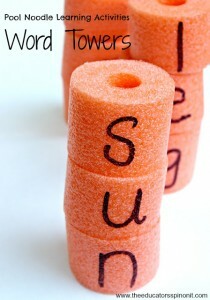 Encourage them to say the name of the letter and the sound it makes. Challenge advanced learners to also give you a word that begins with the selected letter. 3. 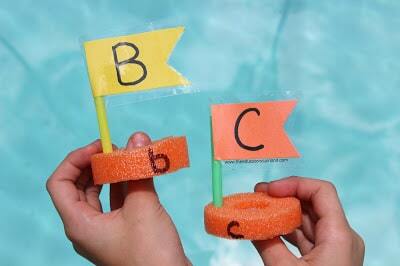 Float the letter boats in a pool or bathtub. We have several Pool Noodle Learning Activities that you might also enjoy. Click on the images below to see how to make and play these pool noodle learning activities! Which Pool Noodle Games will you play first? 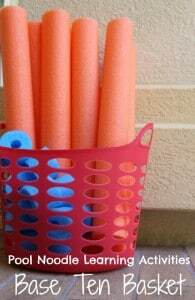 What have you found to be the best way to cut the pool noodles? Your's look so straight! I use a bread knife on a cutting board. Some are straighter than others! The pool noodle game can be played using pieces from just two pool noodles. Children can add using three or four numbers if they like.